ECDN Management portal provides status indicators in "Servers" list page and "Server details" page. Servers list page displays a list of all your ECDN servers. You may sort this list by server name or locations in ascending order, by clicking the column header. The Health column provides a color coded status indicator which indicates the overall health of that server. This health status is an aggregate of health status of individual services running inside this server. A mouse hover over the status indicator displays a popup that shows the health indicator of each component service. We first describe the overall status indicator states. Next we describe each component service indicator state in detail. Green - indicates the server is healthy in all aspects . The status of all underlying component services on this server are healthy. Orange - indicates that the server is in the process of updating its configuration. Its a transient state. Usually configuration updates happen very quickly, and you will very rarely see the server status as pending. Red - indicates one or more component services is unhealthy. Grey - indicates that the server has be manually "disabled" by the user. A disabled server is removed from the available list and is NOT used to cache and serve video traffic. A common use case is to disable ECDN servers that are dedicated for testing. Rather than deleting them, such test server instances are enabled only for a short time (like testing a new version), and then disabled to ensure that production traffic only flows through instances designated for production. Software & configuration - This represents whether the server has the most recent configuration data. When users make and save configuration changes in the ECDN Management portal, the new configuration values needs to be propagated to the ECDN server instance. A Green indicator means, that the server has the most recent configuration values. A Orange indicator means, this server has an outdated configuration compared to the changes made by the user in the ECDN portal. If automated propagation option has been selected, then this status indicates the server is in the process of downloading the configuration values, and restarting its services to put the new values in effect. A Red indicator means that while updating the configuration information and restarting the services, there was an error. The status is also shown as red when user specifies "Update remotely", and the server could not download and complete the updates within 5 minutes. If you see this indicator, please open a support ticket. Hardware resources - This represents whether the hardware resources assigned to the ECDN server VM instance meet the minimum requirements. A Green indicator means server's hardware configuration (number of virtual CPUs, memory, and system hard disk size) meets the minimum requirements. 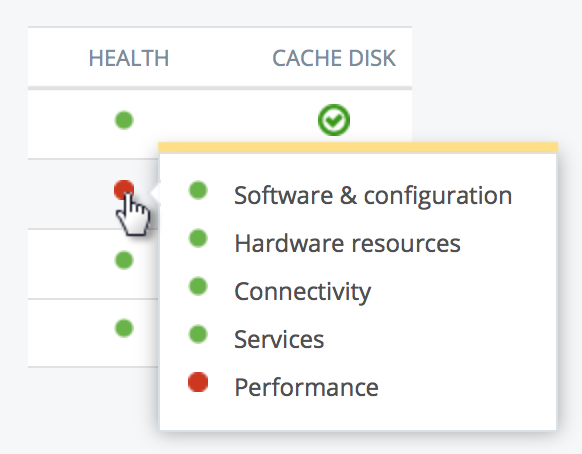 A Red indicator means server's hardware resources do not meet the minimum requirements. This does NOT mean that the ECDN server is not functional. It means that if there were lot of viewers connected to this ECDN server, then the performance will not be optimal. Connectivity - This represents the aggregate status of ECDN server having network connectivity to the required ECDN backend services running in IBM cloud. See the next section for details. A Green indicator means that this server can successfully reach all required ECDN backend services. A Red indicator means that this server could NOT reach one or more required ECDN backend services. Most often the reason for lack of network connectivity is due to network firewall blocking the outbound connections. Please review the firewall configuration to ensure all required destination IP addresses mentioned are reachable. Services - This represents the aggregate running status of all the service daemon processes inside the ECDN server. A Green indicator means that all required service daemons processes are running. A Red indicator means that one or more of the required service daemon processes are not running. This is rare. If you see this status, then please open a support ticket. Performance - This represents the load on the ECDN server. A Green indicator means the load is considered 'normal' and is below the thresholds detailed below. > 2000 viewers connected to one ECDN server instance. In any of these situation you should consider installing an additional ECDN server instance in this location, or increasing the number of VCPUs assigned to this ECDN server VM. The server details page provides more information about a specific ECDN server instance in terms of its configuration, health status, performance and usage data. In this article, we will focus on the indicators that reflect its health. At the top is the "system health" widget that reflects the overall health of the server. GOOD - reflects that the server is healthy in all aspects. POOR - reflects that the server is overloaded or when it is configured with resources (VCPUs, memory or system disk) that do not meet the minimum requirements. If any of the other component status indicators are unhealthy, then the overall health status would also be shown as "POOR". PENDING UPDATE - reflects that this server is not running the most recent version of configuration as specified in the ECDN Management portal. If automated remote update option was picked, then the ECDN server is currently in the process of downloading the latest configuration values and reconfiguring itself. If manual update option was picked, then the server is waiting for the user to manually download the latest configuration data as a "virtual cd" file, attach it in the host hypervisor to this VM, and reboot the server. N/A - reflects that the actual VM associated with this server definition has never successfully called 'home' and hence its status is "not available". The "Last check-in" value shows how long ago this server reported its health status. By design ECDN server upload their health status and usage metrics every 30 seconds. The "Performance metrics" column displays details if this server is overloaded as per the thresholds described above under the "Performance" status indicator. Activation status displays whether this ECDN server is in enabled or disabled state. "Enabled" - indicates this server is enabled and available to serve video traffic. "N/A" - indicates this server has been disabled by the user, or was never able to successfully connect back to ECDN backend services. Disabled servers are removed from the available list and not used in the caching and delivery of video traffic. This displays the system resources assigned to this ECDN server instance. If any of the resources do NOT meet the minimum requirements, then those values are displayed in "red" color and the overall health status of the server is changed to "POOR". If a server VM associated with this entry was not able to successfully upload its health status, then "N/A" value is displayed. This set of indicators reflect the network connectivity of this ECDN server instance to the ECDN backend services. If not healthy, users should review the firewall settings to ensure all required destinations are reachable. Video sources - This set of backend service end points are used to download the video content. ECDN API - This represents connectivity to the ECDN backend API end points that collect server health status and usage metrics. ECDN updates - This represents connectivity to the ECDN backend end points that are used for downloading server updates. This set of indicators reflect the runtime status of service daemon processes running inside the ECDN server. If any indicator is red, then the aggregate health for connectivity indicator will be red too, as shown on the server list page. Green - indicates the process is running. Red - indicates the process is not running. Users should open a support ticket. Grey - indicates user has not enabled this feature. Caching service - indicates the status of the video content caching service process. If this indicator is not green, users should open a support ticket. Logging service - indicates the status of the log collection and uploading them to ECDN backend process. If not healthy the server will not be able to upload system logs, but will continue to serve video traffic. Metrics service - indicates the status of the metrics collection and upload to ECDN backend process. If not healthy the server will not be able to upload usage metrics, but will continue to serve video traffic. SNMP polling - indicates the status of the SNMP agent process. This process only runs when you have explicitly enabled SNMP polling in the ECDN server configuration in the ECDN Management portal. If not enabled, it will show a grey indicator. Regardless of its status, the ECDN server will continue to serve video traffic. Log forwarding - indicates the status of the log forwarding process. It will be green only if user has enabled log forwarding in the ECDN server configuration in the ECDN Management portal. If not enabled, it will show a grey indicator. Regardless of its status, the ECDN server will continue to serve video traffic. Remote assistance - indicates the status of the VPN process. ECDN Management Portal allows customers to selectively enable/disable a VPN connection from an ECDN server to an IBM Cloud Video ECDN server "terminator.deepcaching.com" in the cloud. When enabled, it allows ECDN operations team to remotely login to this ECDN server, and help with the problem determination and perform server upgrades. If enabled for this server, it will show a green indicator. If not enabled, it will show a grey indicator. Regardless of its status, the ECDN server will continue to serve video traffic. Note: A green indicator does NOT reflect that the server has successfully established a VPN connection to the ECDN backend service. It just means that the VPN process is running. The VPN tunnel establishes an OpenVPN connection via port 443. Hence, it requires the firewall to NOT block such outbound traffic via port 443 to terminator.deepcaching.com.